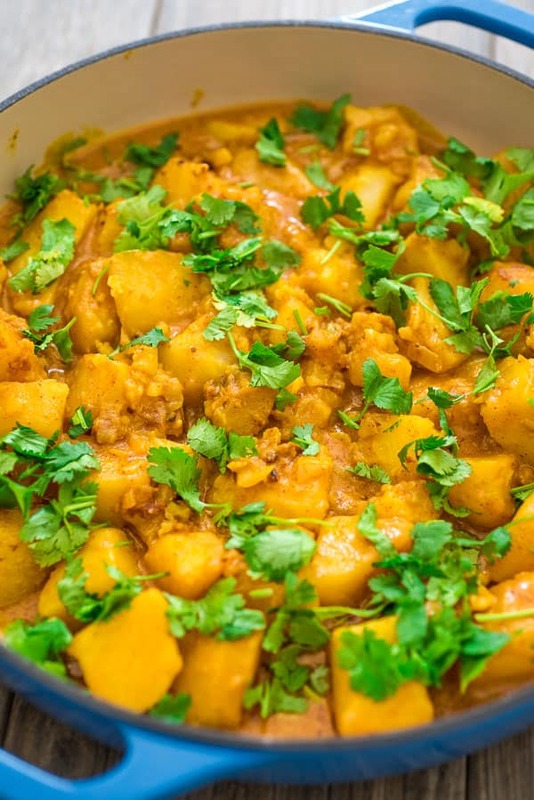 This Potato Curry makes an incredible dinner. It is a one-pot meal that requires minimum ingredients and delivers maximum flavor! I serve it with delicious cucumber-yogurt sauce, which complements potatoes so well! Did I mention that these are very easy to cook? I know I didn’t, but it is something I want to emphasize — VERY EASY. Just dice some onions and garlic, cube the potatoes, sauté all of it with spices for a few minutes, and then pour the coconut milk on top and you are pretty much done. Your dinner will be ready in about half an hour. Let’s talk about the main ingredients. It is best to use red-skinned potatoes (Red Bliss) in this recipe because due to their waxy texture, they hold shape really well. These potatoes are easy to find, since they are very common, and sold in almost all grocery stores and supermarkets. New potatoes of any kind would work really well, since they are also waxy. You can use Yukon Gold, too. If you are not a big fan of coconut milk, feel free to substitute it with Half & Half (a blend of equal parts whole milk and cream). No problem there. I tried both versions and both are fantastic. When using coconut milk, make sure you are using full fat, canned coconut milk, and not the coconut milk sold in cartons, as a dairy-free milk alternative. 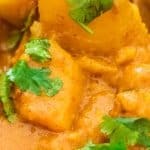 Curry is not a single spice, but a unique blend of spices, which differs greatly in intensity, flavor, and heat level from region to region. If you have your favorite curry powder brand already, definitely use it, but if not, I recommend buying Mild Curry Powder. 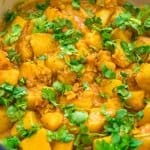 You can also make it yourself: Mild Curry Powder Recipe. To make the sauce, just mix all of these ingredients together. Keep in the refrigerator until ready to serve. 1. Dice the onion and set aside. 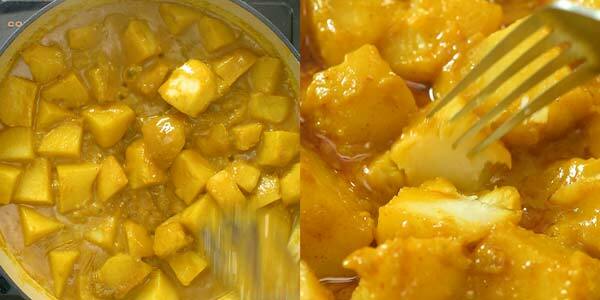 Peel the potatoes and cut them into medium-sized cubes. 2. In a large skillet, heat up the olive oil over medium heat. Add the diced onions and sauté for 3-4 minutes. 3. Add the garlic and all of the spices, and cook for about 1 minute. 4. Add the coconut milk, stir well, and add the potatoes. Reduce the heat to low and cover with a lid. Then, let the potatoes simmer for about 30-35 minutes (depending on the size of the potato cubes), checking and stirring them every once in a while. 5. 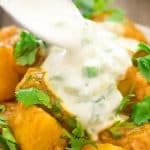 At the end of cooking, the potatoes should be tender and the sauce nice and creamy. Taste it to see if you like the amount of salt and spice. If you feel that there is too much sauce, keep cooking the potatoes for a little longer without the lid. If, however, you feel that there is not enough sauce, add a little water. 6. 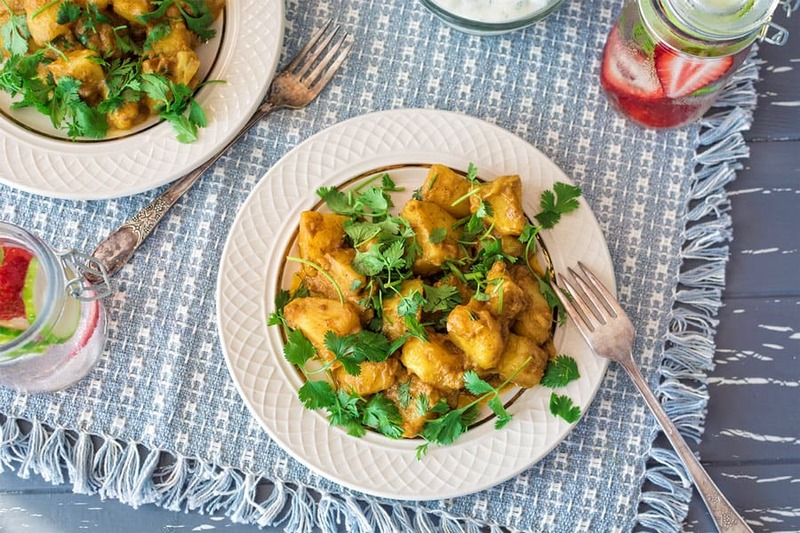 Serve with A LOT of fresh cilantro; it complements the flavors so well! Yes. Made with wholesome ingredients, and immune boosting spices, this dish is filling and healthy. Use a lot of fresh cilantro for extra health benefits. The Cucumber-Yogurt Sauce is light and full of probiotics. Cucumber-Yogurt Sauce. This is my most favorite way to serve these potatoes. You can find the recipe above. Fresh Salad. 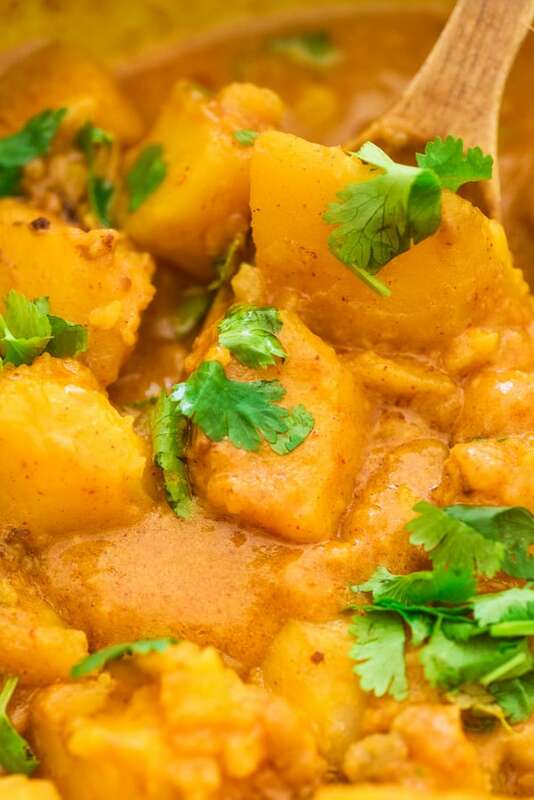 Any fresh salad will pair wonderfully with this Potato Curry. These are my favorites: Simple Kale Salad (vegan), Perfect Tomato Salad (vegan), Skinny Cabbage Salad (vegan), and Creamy Cucumber Feta Salad. Roasted Zucchini Salad. This salad is so flavorful and healthy, you’ll want to make it over and over again! Vegan. Roasted Vegetables. This is the easiest, simplest, and tastiest Oven Roasted Vegetables recipe you’ll ever try. Easy Salmon Patties. These will make a great side for any seafood lover! Chicken. These Easy Chicken Kebabs and Paprika Chicken Legs will please any meat lover! 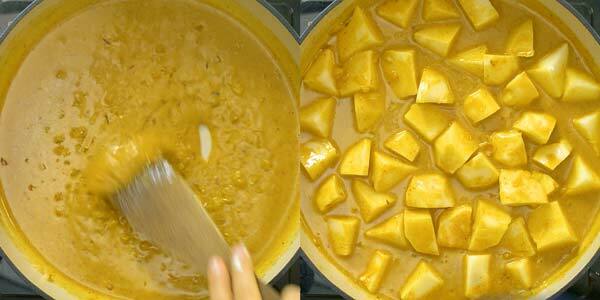 Refrigerate the potato curry, tightly covered with a lid. Properly stored, it will last for 3 to 4 days in the refrigerator. 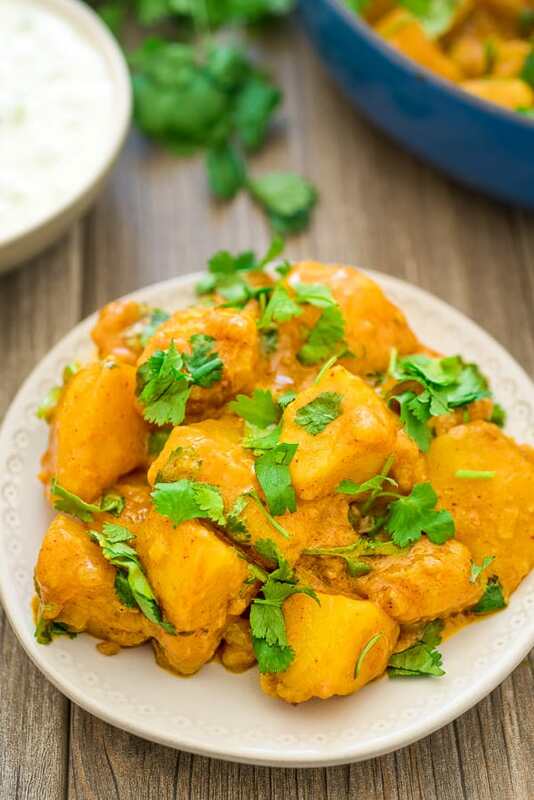 Other recipes for potato lovers. 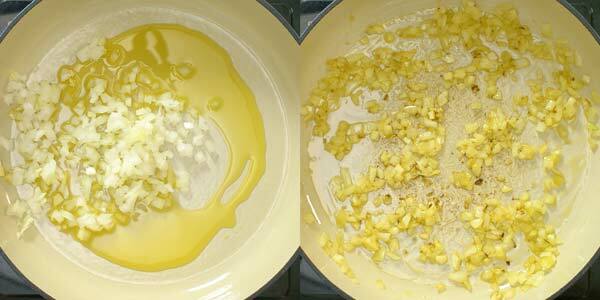 In a large skillet, heat up the olive oil over medium heat. Add the diced onions and sauté for 3-4 minutes. 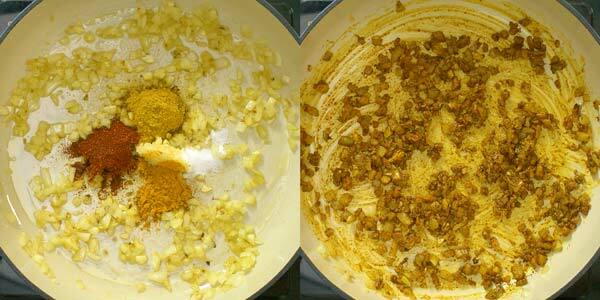 Add the garlic and all of the spices, and cook for about 1 minute. Add the coconut milk, stir well, and add the potatoes. Reduce the heat to low and cover with a lid. Then, let the potatoes simmer for about 30-35 minutes (depending on the size of the potato cubes), checking and stirring them every once in a while. 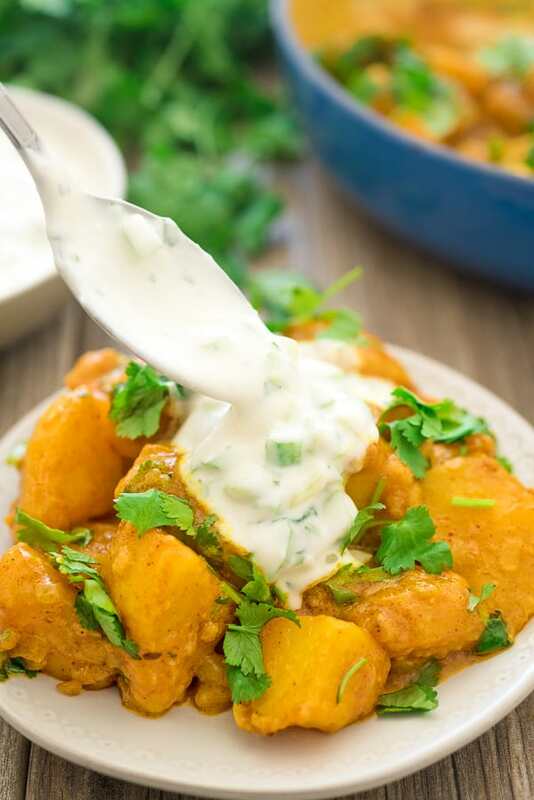 At the end of cooking, the potatoes should be tender and the sauce nice and creamy. Taste it to see if you like the amount of salt and spice. If you feel that there is too much sauce, keep cooking the potatoes for a little longer without the lid. If, however, you feel that there is not enough sauce, add a little water. Serve with A LOT of fresh cilantro; it complements the flavors so well! Mix all the ingredients together. 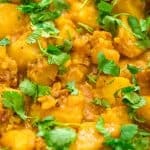 Add the sauce on top of curried potatoes. Note: this recipe has been updated. See original photo below. This was absolutely scrumptious! My whole family loved it! Thank you so much, Jess! Glad to hear you enjoyed it!